If you don't like that GCHQ and the NSA can listen in on all your network activity, here is your chance to Reset the Net. 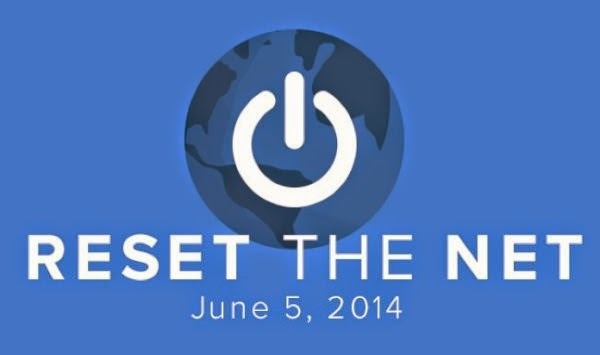 Today, a coalition of thousands of Internet users, companies and organizations launched a campaign for a day of action to “Reset The Net” on June 5th, 2014, the anniversary of the first NSA surveillance story revealed by whistleblower Edward Snowden. Tens of thousands of internet activists, companies and organizations committed to preserving free speech and basic rights on the Internet by taking steps to shutting off the government’s mass surveillance capabilities. More than 20 organizations and companies support the launch of the campaign including Fight For The Future (who initiated the campaign) along with reddit, CREDO Mobile, Imgur, Greenpeace, Libertarian Party, FireDogLake, Thunderclap, DuckDuckGo, Disconnect.Me, Demand Progress, Access, Free Press, Restore the Fourth, AIDS Policy Project, PolitiHacks, OpenMedia, Free Software Foundation, Bill of Rights Defense Committee, Code Pink, Popular Resistance, Participatory Politics Foundation, BoingBoing, Public Knowledge, Amicus, New America Foundation’s Open Technology Institute, Progressive Change Campaign Committee, Student Net Alliance, and the Center for Democracy and Technology. Internet users are invited to join in on the day of Reset The Net to install privacy and encryption tools and secure their personal digital footprint against intrusive surveillance. Technical information here and press release here.